While it may be true that diamonds are a girl’s best friend, finding some you like can be overwhelming. I recently stumbled upon a line called Dana Rebecca Designs of chic, modern, yet classic pieces of handcrafted diamond and gemstone accessories. The collection, which is inspired by designer Dana Levy’s world travels to exotic locales like Africa, Asia, Tanzania, Hong Kong and India, offers stunning gemstone and diamond jewelry that resembles each location. Some of the exotic stones you’ll find in the line include sleeping beauty turquoise, angel skin coral, blue topaz and chrysoprase. And, each order can be custom-made in either 14-karat or 18-karat white, yellow or rose gold. The selection of earrings, necklaces, rings and cufflinks are perfect for weddings or other sophisticated soirees. But what I like best about the collection is its ability to look fashion-forward and chic while still maintaining a classic feel. Each collection is named after a family member or a close personal loved one to Dana Levy. Dana Rebecca Designs is actually not Dana Levy’s first foray into jewelry; she is the daughter of a jewelry manufacturer and fittingly so, spent hours in her father’s jewelry factory among fine jewels and baubles. Her fascination with sparkly pieces grew and when she was 16, Dana Levy launched her first jewelry collection called, ITSADANA. The line was quickly picked up by fine department stores, but balancing high school and a jewelry line is quite the task. Levy decided to pursue her education full time at the University of Texas Austin followed by the Applied Jewelry Arts Program at the Gemological Institute of America in Carlsbad, California. Each of the pieces in the Dana Rebecca Designs collection is handcrafted with luxury diamonds and gemstones. They can be found in fine, specialty boutiques across the country and are also available at www.danarebeccadesigns.com. I especially heart these earrings below, perfect for a little black dress for any dinner or night on the town. I’ll amend said statement above. They’re pretty enough I’d wear with a wife beater and jeans. Everyday. Definitely obsession-worthy. 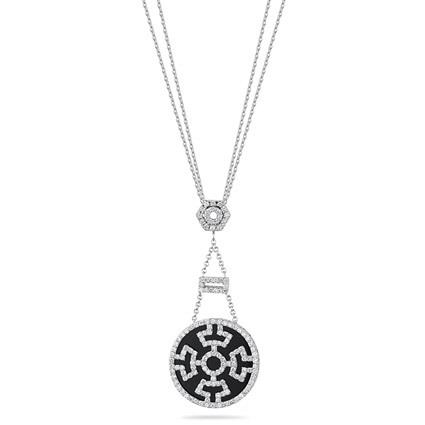 Dana Rebecca Designs “Brittany Nicole” Onyx 14-karat white gold necklace with 1.56 ctw, $3,080. 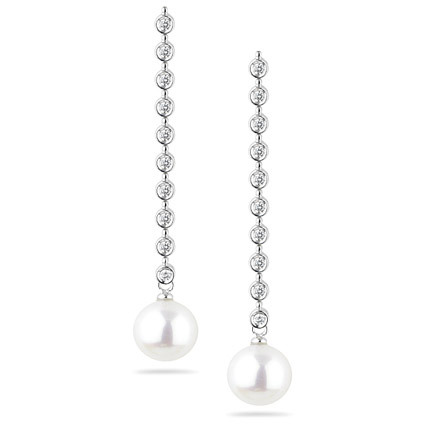 Dana Rebecca Designs “Betsy Ellen” 14-karat white gold earrings with .38 ctw and 9mm white fresh water pearl, $880. I have always found myself buying jewelry that is as original as it is unique. I enjoy passer-buyers asking me where I bought my specific piece of jewelry and opening their eyes to hidden treasures. I feel that jewelry makes a statement so why not be exclusive and have a piece that not everyone owns. Oh wow – I’m in LOVE!!!!!!!!!!!!!!!!! Love the necklace especially–dress up or down! Are these diamonds conflict-free? I hope so. As a Newbie, I’m constantly browsing on the net for articles that may assist me. Thank you.